Right now, the JOIDES Resolution is drilling on the second oldest seamount in the Louisville Seamount Trail. We would have drilled on the oldest one, except it is already on its way down the Kermadec Trench, which has tilted the seamount at an angle that we could not drill directly down into its succession of lava flows. It is possible there used to be even older seamounts than that one, but those would have already ridden all the way down the trench to become magma again,* so we can only assume they existed. 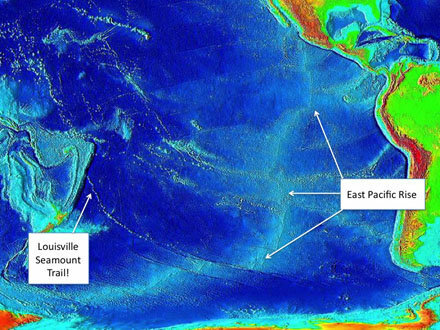 All the Louisville seamounts are slowly travelling to their doom in the Kermadec Trench for the same reason that a stationary hotspot was able to create the 4000 kilometers (2,485 miles) long Louisville Seamount Trail. The plates in the Earth’s lithosphere (what you are currently standing on) are moving, but not quickly (at least from our perspective). For example, if you were going to move your couch ten feet across your living room at the approximate speed the Pacific Plate under the Louisville Seamount Chain has been moving, it would take you about 61 years. Even though the Pacific Plate moves slowly, it is literally moving mountains. It is also being made by mountains. To the southeast of the Louisville Seamount Trail is the East Pacific Rise, a rift in the ocean floor where magma continually rises and solidifies into new rock. The new rock is formed by magma that rises from the same convection currents that push the seafloor away from it on both sides of the rise, causing the ocean lithosphere to move with them. If you drew an arrow from the youngest seamount in the Louisville seamount chain through all the other ones to the oldest one in the Kermadec Trench, it will show you the direction the Pacific Plate has been moving. The East Pacific Rise is similar to a hot spot because it is also formed by magma rising from the mantle, except if a hot spot were a candle, then the rise would be an entire row of people holding up their lighters at a Def Leppard concert, and in this case, the row would extend from Southern Cailfornia to Antarctica.